Fed up with the low level of banking services in France, two entrepreneurs decided to have a crack at business banking. Since the launch in 2016, the Qonto team has grown from the founding duo to 80 people. They have attracted over 20,000 small businesses to their bank and closed two funding rounds, pocketing about €12m. 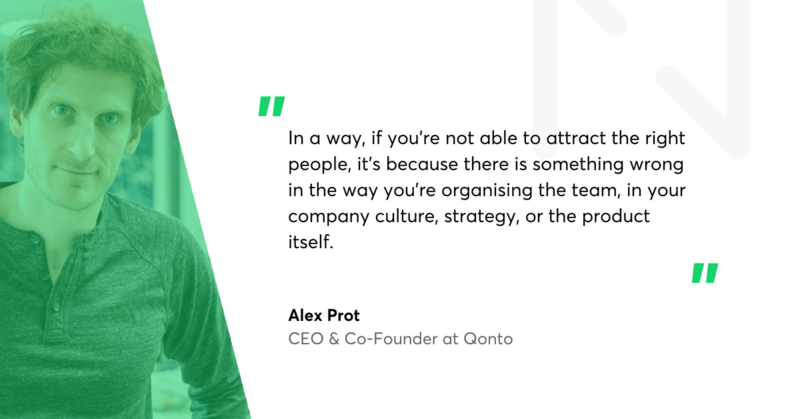 To learn more about the Qonto way, read our interview with Alex Prot, co-founder and CEO at Qonto. Tomasz Grynkiewicz, Netguru: If I would put an acquisition offer for Qonto on the table right now, would you sell the company? 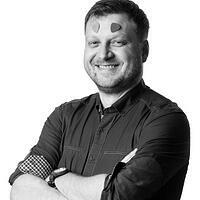 Alex Prot, co-founder and CEO at Qonto: No. Any price anybody could offer won't be right today. I wouldn't feel comfortable if I had a big check in my pocket and wouldn’t have to get out of bed tomorrow. I’m happy doing what I'm doing now, and I'd be happy to grow Qonto for the next years. Maybe, just maybe, you would get a different answer then. But our ambition is to replace traditional banking. We believe we could lay the foundations for something bigger. The next few years will all be about scaling, growing Qonto in France, and expanding to the other European countries. Let me ask you about the beginnings. How did Qonto start in the first place? Let me guess. The pricing was not acceptable for small or even midsize businesses, right? Oh, it was far worse. Not only it was expensive, but it also lacked transparency. It was tough for us to understand what we were paying for. At the end of every month we had some lines in our bank statement we couldn't understand. That pain remained buried in our minds for a couple of years. After our company got acquired, we realised we had the time and resources to build something new. We knew that business banking was broken and we decided to have a crack at it. To start a company based only on personal experience - that sounds risky to me. We did not invest blindfolded. Before we even started to work on Qonto, we interviewed over a hundred small business owners. We talked not just to digital startups, but also architects, Uber drivers, sole traders etc. They all confirmed they were unhappy with their banking services. So we spent about a year building and designing the product, and we launched Qonto in July last year. Two years ago it was you and Steve Anavi at the company. What does Qonto look like today? Now we have 80 people on the team and over 20,000 customers. What I’m especially proud of is that our customers are suggesting their friends, co-worker, suppliers and anyone else to try and use Qonto. That is the best marketing I could ever imagine. What are the significant challenges ahead of your company? Scaling as a team and growing as a company. In 2019, we’ll start expanding to other European countries. But the most critical goal is to focus on having the best product and the best customer experience we can get. We know for a fact that all metrics regarding customer satisfaction are highly correlated with our growth. The kind of growth we expect poses some organisational challenges. Having in mind our expansion plans, we need to scale our tech team, sales team, customer support team etc. We need to decide how to regroup teams, how to align the recruiting efforts for our new offices and Paris headquarters. All these puzzles you need to solve, big and small. Growing fast does add complexity, but these are the kinds of challenges I’m happy to tackle. Judging by my recent interviews, the shortage of qualified people is the single most worrying fact for any fintech founder. How does it look with Qonto? If I could snap my fingers and have ten skilled developers more, five top marketing or customer support persons more, I would hire them on the spot. Finding the right people is not an easy task, France is no exception. The unemployment rate is going down; there is more demand than supply, the industry in which Qonto operates is highly competitive. So we're happy that some of these people we were interviewing, many of whom had the opportunity to choose between Google, Facebook, some French startups or Qonto, ended up joining us. Long story short, the market is tough right now. It is, but it is also a good check if what you're doing makes sense. In a way, if you're not able to attract the right people, it's because there is something wrong in the way you’re organising the team, in your company culture, strategy, or the product itself. How do you ensure that Qonto is an attractive place to work and remains that way? I think we’ve shown our ambition in what we're doing. The whole team understands that after the somewhat moderate success with our first company, Steve and I want to make a lasting impact. Moreover, we're transparent and clear about things going on in the company: results, numbers, processes etc. We have all-hands meetings, where each month we discuss anything related to Qonto. But the most important thing is to make sure that your team is doing their jobs and learning at the same time. Your employees need to see the impact they have on the products they build; they need to understand how they all contribute to the growth of the company. What's interesting is that even the largest fintech companies that have been quite successful, the likes of N26, Transferwise, and Revolut, are also fighting for talent. The challenge is not only in getting the right people, but also keeping them in-house. What makes Qonto stand out from the fintech crowd? We are the first fintech addressing a vast spectrum of small businesses, from 1 person to 100-strong teams, from established to newly incorporated companies. The second thing is that we're not only offering them one account or one card, but are working to able to replace all of traditional banking. We’re not there yet; it's not going to be an overnight job. But our goal is evident right from the start. I think that’s unique. Most fintech companies in France or Europe focus on a single use case and narrow market segments. Let’s say they have an excellent offer for corporates, but they don’t have anything to offer to freelancers. Or let’s say they’ve designed the best payment card ever, but they won't serve any other needs. There are many neobanks which started with consumer banking. Some of them already count their customers in millions. I’m seeing what you’re getting at. Admittedly, we can’t compare ourselves with retail banking regarding numbers of users and revenue. When it comes to margins and profitability, I’m not so sure who is in the better shape though. Anyway, that is not the point. Every once in a while I notice neobank announcing plans to enter the SMEs market. The problem is, SMEs, though small, are still businesses, with needs far different from consumer banking. What do small businesses need then? Accounting, VAT declarations, invoicing. They need to be able to share an account with other people on a team or with an accountant. That's why we were focused on having a multi-user account, with adjustable rights and different user permissions etc. From day one, we thought of what would be the best tool to make an entrepreneur’s life easier. Replacing a bank is an ambitious task, and, as you’ve said, it’s not an overnight job. We're not thinking of doing everything ourselves. We have a great current business account, but it's going to be connected to a lot of different services. One of the things we have on our roadmap is to sign a few partnerships over the next 12 months. Either for credit, factoring, or insurance. We hear all the requests and questions from our clients. We see what's important to them and we can adjust our roadmap to find the best answers. We've done that already with iZettle, and Kantox for forex transfers. We have a few more partnerships coming up. Many fintech companies are collaborating with traditional banks. Are you thinking of getting any of them as Qonto partners? Right now we're not willing to do anything with traditional banks. It sounds as if you’ve just dug up the war axe. No, no, no. It is not about ideology, I’m thinking about more pragmatic reasons. Large banks are usually too slow and too complicated to partner with fast-growing companies. Let me give you an example. You may have heard about the partnership between Transferwise and the BPCE Group. 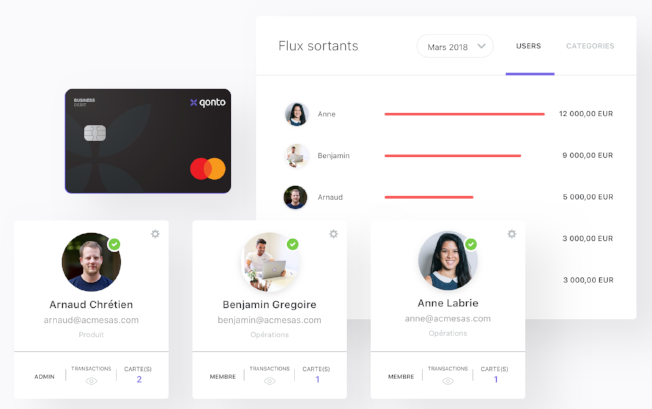 One of the top European fintech companies partnering with a large French banking group. What is so extraordinary about that deal? To be clear, I do not have access to any behind-the-scenes details. But let me explain the way I see it. First, it took several months just to come to an agreement. Second, both parties announced the partnership in June, but it's going to be live somewhere at the beginning of 2019. So you don’t believe that there is a vast business opportunity coming out of that deal? On the contrary, since they have millions of clients. My point being: this kind of partnership is probably right for an established fintech. In our case, we're still growing fast, and we are focusing on growing the company day after day. Day after day, literally. I’d say that finding out who could be the right partner for a project that might be live in the next 18 months is not, as you may expect, the top priority for Qonto. If you could go back in time, what would you do differently? I would have learnt coding and started a business earlier. It’s never too early to start a business. Which companies inspire you (and why) regarding overall performance and strategy, customer experience, technological excellence? Airbnb (amazing product and new market creation), Ikea (great operations), Nike (amazing branding/marketing). What would be your piece of advice for founders of fintech startups? Do not focus too much on the regulatory part but rather on the fact that you’re dealing with people and businesses money. So having a great product or service is the most important to build trust that is required in that industry. Georg Ludviksson, CEO of Meniga.